I have radiator valves that send readings about the temperature and valve opening to the serial output: Honeywell HR-25. I want to collect those readings in a central server at home without flashing the thermostat with a custom firmware. To do that, I need an Arduino (very bare one) that can receive the serial data, but at the same time I need it to be powered down most of the time, or it would kill the battery life of the thermostat. Can I wake up an Arduino from power down using the serial transmission, and immediately capture the serial data without dropping bits? how? I never tried myself, but afaik you can define an wake up/interrupt from USART, meaning that if you get a receiving byte from the UART it will wakeup the Arduino. When powered up, you can read continuous data. I would be surprised if they make an UART wakeup signal, that bytes would be lost (i.e. that powering up would take too long to miss more UART bytes). You can build a circuit using an electronic counter to only start supplying power to the Arduino at a specific given time. You would still need to supply the circuit, but the energy need would be a small fraction of the Arduino's needs. On the other hand, can't you use a second power source for the Arduino? Li-On batteries are pretty cheap nowadays, and you can always savage something from an old Notebook's battery. NOTE: I assume the "serial" is a UART and its "rest" voltage is 5V. 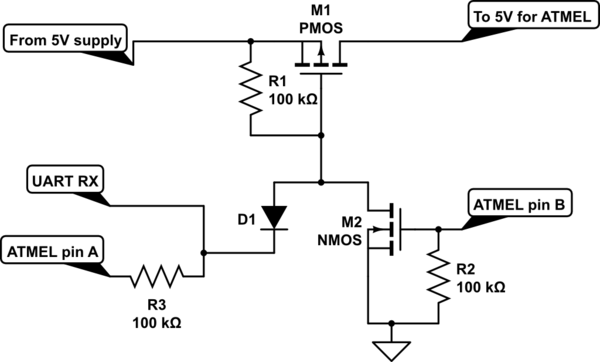 Choose the PMOS so that it is turned on with about 3V. In this case, the circuit is normally powered off. When you receive a START, the PMOS start conducting. The ATMEL will then pull pin B to 5V, thus keeping the circuit powered. Through pin A it can sense the UART. In this case, since you miss the start bit, you won't be able to use the usual libraries or peripherals. You can, however, implement a software uart which can avoid the first start bit to overcome this. Not the answer you're looking for? Browse other questions tagged serial sleep or ask your own question.